A guide to becoming more active with ongoing digital support. Being physically active can help you prevent and manage some of the side effects of cancer treatment, such as fatigue, depression, muscle wasting and risks to your heart health. Choosing to become more active is the first step, but we know it can be hard so we have a range of tools within our Move More guide to help you become and stay more active. 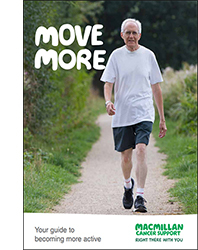 A physical activity and cancer information booklet. Five short flyers about some popular types of physical activity - Activity in daily life, Walking, Swimming, Gardening and Sport. An activity chart and diary to help you plan, record and keep track of how you are doing. A Move More DVD with gentle activity videos you can do at home. Further digital support including motivational emails, access to the online community and the opportunity to ask our physical activity experts. Visit here for more information. Order your Move More guide by clicking on the image at the bottom of the page. For more information about the benefits of getting active following a cancer diagnosis please visit here. If you would like to order additional copies of the physical activity and cancer booklet and DVD you can do so below, by clicking on the relevant image.